When I was 11 I had big plans to become a world-famous Science Fiction writer. I worked out all the details: I'd write a series of books about the adventures of a crew aboard a galactic cruiser. This cruiser belonged to a sort of interplanetary alliance, which had dispatched a fleet of said cruisers to enforce the peace and discover other life-forms and civilizations. The series' chief protagonist would, of course, be the captain. I envisioned him as an athletic chap, something of a swashbuckler - a bit impetuous at times - while his first mate was half-alien, half-human and provided a draught of cool reason to balance some of the captain's more impulsive behavior. I can't recall what I'd christened this ship, but it might as well have been the USS Shmenterprise. Still, I had no desire to write Star Trek novels - of which there were, at the time, exactly 0. The thought never occurred to me, for two reasons: 1) every kid knows novel writing is grown-up work; 2) what's the appeal of working with something already there? No hackwork for me - I was going to be original. At the grand old age of 40, I'm starting to think the appeal of "originality" is a cunning trap set by the devil to bring aspiring writers to despair and ruin. I'll comment on that in my next posting, but for now I want to return to the then-still-virgin territory of Star Trek novels and "fan fic" - work written by passionate Trekkers (I don't know why we object to "Trekkies", but apparently we do. Some of us clearly think we look less lamentable if we're "Trekkers"). In the martini-pickled brains of the mid-70s publishing industry, ST spin-off fiction did in fact amount to a frontier "where no man (had) gone before." As a result, James Blish gained his singular toehold on literary immortality by typing slapdash shorts based on faulty scripts from the series. These were collected in straight-to-paperback editions, and that was the extent of it - until the publishers saw the sales figures of this slapdashery and did a quick re-think. A few ST-based novels were printed in the wake of Star Wars' unprecedented box office success, but the publishers in question chiefly mined material from the original series, going to press with such dubiously energetic efforts as blueprints, technical manuals, and "Fotonovels" (comic books made from cut-and-pasted episode footage). I have no idea what the profit-margin of such labor-intensive publications as blueprints and Fotonovels was, in contrast to, say, an atrocious spin-off novel like Vulcan! From my current perspective (standing in front of the ST shelves at the local book superstore) one-off novels would appear to be the better marketing risk. In hindsight, I wonder if I shouldn't have attempted a mailroom entry into this genre - after perusing a few ST novels, I'm convinced a 12-year-old with a reasonable grasp of the elements of fiction (and a parent willing to proof-read) could do as well as any of the adults currently writing to spec. As it was, I cheerfully filled a few notebooks with the adventures of my Shmenterprise crew. I enjoyed what I was doing, but never thought for a minute that any of it was print-worthy. This activity was akin to practicing the piano – an exercise I was told could, if I was diligent, assist my aspirations to fame. I wanted to see my name on the cover of a book, just two shelves down from James Blish, at our local Coles bookstore, so I wrote. I'm not sure I'd enjoy writing ST novels at this point in my life. I'm told the franchise is remarkably tough on their writers, strictly enforcing a host of limitations that dwarfs those of other spec-fic genres, including romance and Role Playing Game novels. And that's once you gain access to the stable - never mind the hoops galore to be jumped through en route. But I must admit I felt a stirring of embers in my belly when I read this "Mad Max Perkins" interview with Paperback Writer Lynn Viehl. When Ms. Viehl says she only wanted to see her name on the cover of a book, and now has a yearly income in the six figures, I start to think all sorts of titillating thoughts. Might there be a future for the USS Shmenterprise? When I was a kid, you couldn't get less cool than Sunday Night Church. Sunday Night Church interrupted The Wonderful World of Disney, Sonny & Cher, The Six Million Dollar Man, and other TV shows that would have inducted me directly into zeitgeist collegiate. I was, however, the son of a preacher man, a station so far removed from the zeitgeist, I was beyond hope. Sunday Night Church is a fate I wouldn't wish on most people. And yet ... Sunday Night Church has provided me with some incredible memories. For instance: in a small town that didn't yet have Cable, I once heard a visiting preacher, a ponderous iceberg of a man reflecting on the nature of life in contrast to its faith opposite, slowly proclaim, "I had to give up watching Carson, because I knew: this was a man who had no struggles." I'd never seen Carson, but the message struck home. Us mere mortals ingesting the media have to periodically give our head a shake and tell ourselves: life ain't like that. Years later, when I'd moved to the city and seen my share of Johnny Carson and his protégés, I still held to the intrinsic truth of the preacher's message, even as I appreciated the incredible balancing act Carson performed. No doubt "Johnny" had his struggles (how many marriages did this guy attempt? ), but the fact of the matter is, night after night, his televised shtick convinced us that life, if only for one hour, could be an effortless treat. Years later, Carson inevitably deteriorated to weekly fodder for Saturday Night Live - a show whose origins came about when he forced the network to can “The Best Of The Tonight Show”. When he finally retired, the airwaves were filled with tributes of every stripe, but one anecdote stands out in memory - from Ed McMahon, of all people. He recounted how, early in the show's development, they were told the network was ready to close the shop. By Ed's recounting, Carson delivered the news to him over a smoke backstage, prior to a night's performance. McMahon asked, "What do we do?" to which Carson said, "Give 'em a good night's show." The story seems suspiciously apocryphal, but even so it contains a significant grain of truth. If Carson's life was ever complicated, it wasn't just none of the audience's business - it was Carson's business to make it none of the audience's business. There is something peculiar, and disturbing, about this vision: a former magician gains fame assuring his enormous public it's all a painless punch-line, while silently enduring every iota of life's indignities, including finally death. My inner Sunday Night Church Attendee wants to ask: was this guy really The King Of Comedy, or was he The King Lear Of Comedy? Like any impious question, it turns the mirror back on me. And only occasionally do I see a man giving his head a shake, to address the life at hand. I said earlier that I no longer want to live in California, which is true – to a point. More accurately, I can’t quite conceive of living there due to the cost-of-living, which is insane, and the cost of real estate, which is beyond insane. Unless this blog and all the different side-projects I cheerfully putter away at miraculously catapult me into Stephen King’s (or even Anne Lamott’s) income range, there is no profession I could reasonably pursue which would make living there affordable. My wife is another story, but California is my obsession, not hers (by a longshot) and though she indulges me beyond reason, even she has her limits. I have no idea how the gap between the haves and have-nots grew to such a chasm in California. The middle class might have a few creature comforts the truly destitute lack, but in this State they are in fact the working poor. A household, just to exist, requires two-plus incomes. If you take the time to really explore a city like Los Angeles, you quickly become attuned to an incredible energy – ideas, pastimes, an unfathomable underground economy and population – generated just to keep afloat in a wash of personal debt that grows like a tsunami. When you aren’t actively making money, you’re thinking up ways you can (surely one reason why no end of bad ideas seem to find their origin in the West – it’s just the law of averages). It’s like this everywhere in California, to a greater or lesser degree. Where you see this least is usually in hermetically sealed communities like Carmel, or Santa Barbara. Carmel has an aesthetic that genuinely warms the heart. No streetlights, for one thing. Most residential modes shift from cottage to bungalow, and the immediate downtown neighborhoods are a cheerful quilt of non-conformity and breezy style. You understand immediately why Carmel was Henry Miller’s final destination, and why Clint Eastwood got some very particular ideas about the way the town should be managed. It’s a very beautiful, very appealing town. But you’d have to be made of money to move to Carmel. And Santa Barbara is something else entirely. In contrast, Santa Cruz seems almost attainable. Between the starving artists and the successful business people who go to such obvious lengths to make the place aesthetically welcoming, you have a core population that is demographically all over the map, and cheerful about it. No one neighborhood looks like it has a complete stranglehold on capital. Even the toniest beach houses overlooking the Pacific have to rub elbows with shanties that were erected in the 40s, and look like they’ve only served itinerant surfers. As a result, Santa Cruz comes across as a city in process – something else that appeals to me. It clearly generates a great deal of capital; it also reinvests that capital into the city. I don’t doubt the city has its problems and conflicts. But my impression is the discussion is genuinely public, and very vocal. 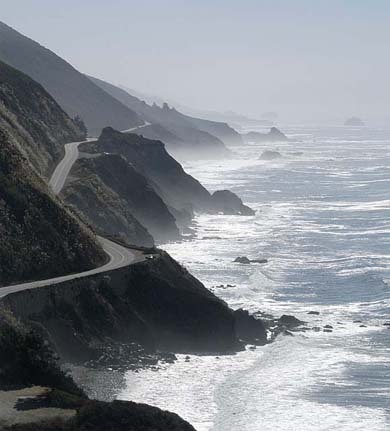 It could be, of course, that this is all an elaborately painted figment of my California-smitten-imagination. If so, I am happily none the wiser. Which is, I think, the best frame of mind to be in when you are forced to bid farewell (for the moment) to a mistress of locale. 1) The logging truckers of Oregon. Don't ask me how they do it, but those cats can take a hairpin curve at greater speeds than you on your souped-up Japanese scooter. Stay out of their way! 2) RV drivers in California. Sooooo sloooooooow. You will best avoid this white-haired scourge by planning your motorcycle trip in March, or April at the latest (a logistical nightmare, if you're Canadian - but there you go). 3) Having said that, I completely sympathize with these elderly road-hogs. The one thought that kept flashing on my brain's digital read-out was, "TOO FAST! IT'S ALL HAPPENING TOO FAST!" The geographical changes, the differences from one small coastal town to the next, even the attitudinal shifts that occurred within the populace as you crawled further south - on motorcycle, the transformation of my environment was witnessed at a speed that did not do the landscape justice. And I was but a cad of 21 - an age when things usually occur at too slow a pace. Bicycle, I thought, might be more appropriate. No matter what vehicle you choose, this ride is among the nation's most spectacular. If you can manage the entire trip to San Diego, you will fully experience the mystic lure of The West. You will also experience some of the frustration that comes with living there, and you will understand why people put up with it. It is an awe-inspiring journey that just might move you to quote Shakespeare, with both Hamlet's irony and your own baffled conviction: "What a piece of work is man! how noble in reason! how infinite in faculties!" The argument has been made, persuasively I think, that suburban design is the heinous antithesis of every worthwhile architectural value that preceded it. I’ve even bought into this argument to the point where my family now lives in a century home. We're continually budgeting for the next upgrade, or maintenance project, but I love the high ceilings. I’m mad about the tall, vertical windows, and I note with special gratitude that no one view out any of our windows looks directly into the window of a neighbor’s house. Just over the hill, in a recent development, live my in-laws. When I look out their living room window, I stare directly into the living room window of their neighbor across the street. On a sunny day, I can see straight through this neighbor’s house into their back yard, thanks to the correspondingly large window on their back wall. Perhaps I’ve seen too many Oliver Stone movies (actually, there’s no question: I have), but it occurs to me that an assassin with a high-powered rifle could set himself up on my father-in-law’s picnic table, aim said rifle through my father-in-law’s house and through his neighbor’s house, and easily tag the yappy little dog in the back yard of the house behind them. For all I know, a powerful scope could achieve an even larger range, thanks to all those windows so artlessly lined up. So there it is: suburban design highlights and exacerbates our vulnerability. (Perhaps this explains the SUV’s popularity?) I’m glad we got that out of the way, because now I can confess: I love to look at it. In the same way Lt. Col. Bill Kilgore loves the smell of napalm in the morning because “it smells like victory”, I love the look of early suburban design, because it looks like ... progress! Mildred Shroom, B. Hom. Ec. When I was a small-town youngster (i.e. 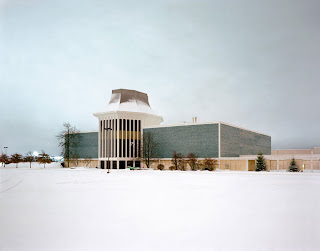 young enough not to object to being called a “youngster”), my second-favorite building was the bowling alley (my favorite was the newly-built Senior High School, a 70s-era construction with confusing hallways and fluorescent lighting, populated by curvaceous babysitters and their swaggering, long-haired boyfriends – material for a future entry, perhaps). The bowling alley was an anonymous cinder-block building, except for its auqua-green paint-job, artist’s-palette-eave and the angular neon sign in the parking lot. Inside, the floor was linoleum tile and hardwood, the counter and table surfaces all formica. The bowling balls (this is five-pin bowling I’m talking about) were painted with psychedelic colors to highlight the wood grain. And with the press of a button, I could initiate a whirring, clanking mechanical extravaganza to sweep away leftover pins, and replace them with a perfect, upstanding V-configuration. For a kid who had yet to witness an automatic garage-door-opener, this was marvelous, marvelous stuff. It was like I was visiting the Jetsons, or Gyro Gearloose’s Duckburg workshop! 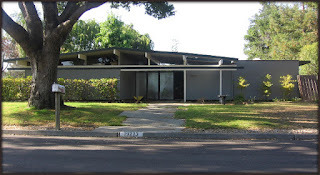 Driving San Jose, with its Eichlers and Wursters and Lautner-knock-offs, is like driving through the future of my past. It’s a dangerously heady whiff of nostalgia, a glimpse at a fabled vista that once overlooked the future, but now gives view to the nation’s largest automobile graveyard. These buildings remain steadfast, ever-gaining in their property value. They are glistening testaments to a hardheaded optimism that was going forward – making progress, and damn the consequences. I certainly wouldn’t want to live in something like that – just as, had I been forced to spend the night either in the bowling alley, or the “haunted” house two doors down, I’d have gone for the house. But I’m grateful these jarring sweeps and angles are still standing. If nothing else, it’s worth recognizing the “context of no context”, if only to return to aesthetics that value and contribute to human dignity. I was set to opt for the simpler heading "California Bookstores," but bookstores are not all created equal. I know this first-hand, having spent several years at an independent bookstore that underwent a series of sea changes. It was a tumultuous time, but when the place "worked", the experience was a joy for both customers and staff. My final year there I had enough seniority to choose Saturday as my day off: I declined, in part because Saturday customers were a treat to serve. People's agendas were looser, they browsed at length, and willingly engaged in conversation that frequently led to large sales. Satisfying work, that. Bookstores don't require that sort of environment to be worthwhile, but it sure helps. I've found my share of literary delights in Ferlinghetti's City Lights Books, but I'll willingly take the taxi to A Clean Well-Lighted Place For Books, just to forego the habitual surliness of City Lights' boho staff in favor of ACWLPFB's professional cheer. More delightful still is Bookshop Santa Cruz. Like City Lights, BSC wears its (anti-Bush) politics on its sleeve; unlike City Lights, BSC staff members seem to enjoy what they do, to the point where they don't mind stocking material with opposing perspectives. I don't go to bookstores for their politics, though (I mention it only to hammer home the point that there's no good reason why you can't be a disgruntled lefty and still provide cheerful customer service). BSC is a treat because virtually every shelf in the store is flagged with numerous strips of paper with written recommendations by staff members. This is a terrific method for selling books, given that the most avid readers are usually introverts. Besides, it's reading about reading; this tack cannot be over-utilized, and BSC and ACWLPFB put it to good use. 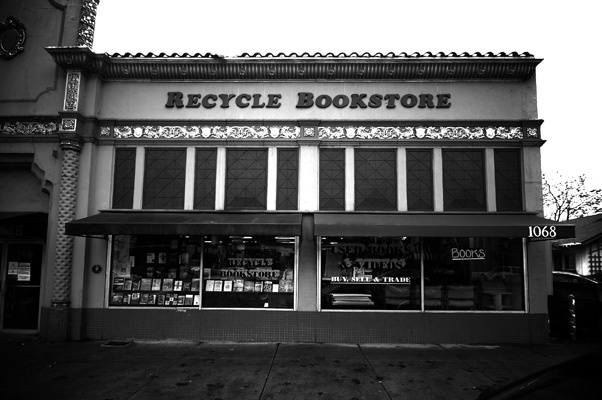 San Jose's Recycle Books doesn't have this practice, but I still manage to buy a dozen books a visit. This is due in no small part to the excellent discretion of the store's buyer; it's also due to the pricing scheme. Paperbacks are typically sold for half their cover price, and hardcovers just a few dollars over that. So if, for example, I see Paul Auster's Leviathan on sale for $7 pbk and $11 hc, I'll usually spend the extra four dollars for the clunkier hardcover. What this usually requires, of course, is an extra suitcase holding only books. Back-breaking work, these visits, but I wouldn't miss it for anything. My wife, an international traveler of the first order, easily manages the time difference between California and Central Ontario. For me, however, those three hours are a killer. My internal clock has been set so fixedly, it's practically an element in my genetic coding. I consider a 7:00 a.m. rise and shine "sleeping in," and am usually up out of bed by 6:00. My daughters typically wake up shortly after I do. The first few days of any California visit I and my girls will be awake and ready to go by 4:00 a.m. Consequently I rely on several gallons of coffee to keep me up to speed. Peet's is the best of the chains. The quality of their roast is easily superior to That Prominent Chain We're All Familiar With - the beans are dark and shiny with oil, and the store-brewed coffee is heartier fare than you are likely to find anywhere, outside of an exceptionally passionate independent. 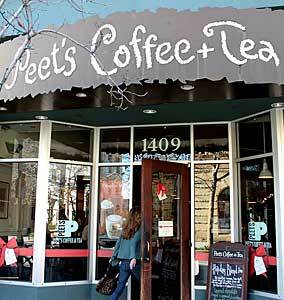 In Northern California, Peet's cafes are easily found, but their frequency tapers off when you leave the San Francisco, San Jose, Santa Cruz triangle. My father tells me the owner was asked why the chain wasn't expanding more aggressively; the owner apparently said this was as big as it was going to get, because anything larger would result in a loss of quality control. It's also worth noting that Peet's was ahead of the consumer curve regarding fair trade, and organic beans - the latter being an offered choice, the former non-negotiable. Any way you drink it, it's good coffee. Mario’s Bohemian Cigar Store in North Beach San Francisco is a corner café of some renown. Rumor has it Francis Ford Coppola scribbled down the first draft of The Godfather there, but I’m skeptical. Mario’s seating is informal and comfortable – but not that comfortable. I have no doubt, however, that Mario’s has a special place in his heart. The Cigar Store does have a modest selection of cigars, if you’re into that sort of thing, but their real claim to fame rests on their toasted open focaccia sandwiches. This writer is particularly taken with the grilled eggplant, and I heartily concur with her. Mario’s earned its fame with this sandwich, and is worth seeking out. However, for those who can’t book the next flight to San Francisco, here’s an easy focaccia recipe. As for the grilled eggplant, caramelized and lightly suffused with balsamic vinegar ... you’re on your own! The conversation in California differs considerably in quality from the conversation in Newfoundland (material for a future entry, perhaps), but the charming thing about California conversation is that, in sharp contrast to Toronto, it exists. This is a trait I’ve always appreciated about the citizens of the United States – so long as you are not the sole occupant of any given space, you have a ready interlocutor. I've conversed with complete strangers while cueing up for a movie, shopping for post-cards, visiting the local library, buying a pair of shoes ... Thankfully, none of these has ever concluded with a hug (too far out of my comfort zone, still - after all, I'm not just Canadian but Mennonite) but it leaves me with the impression that becoming a “neighbor” in this State would not be a long or difficult process. Somebody went to a lot of work to pull this off. If you have high-speed, do check it out. And no, this shouldn't get you in trouble if you're at work (unless you start singing along). 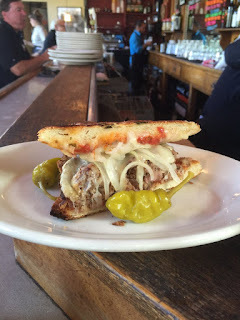 This delight comes with some specific conditions, most notably: the eats have to be good. There's nothing less appetizing than lame Mexi-Cal: tofu that can be identified doesn't belong in even pseudo-Mexican dishes, and the Californian propensity to fetishize chicken breasts (which, I suppose, might be symbolically appropriate) can really detract from the larger, more delightful menu at hand. Worthy Mexi-Cal chefs don't bring Hollywood to Mexico: they make the dinner table a multi-cultural, ecumenical, hyper-sensual experience. 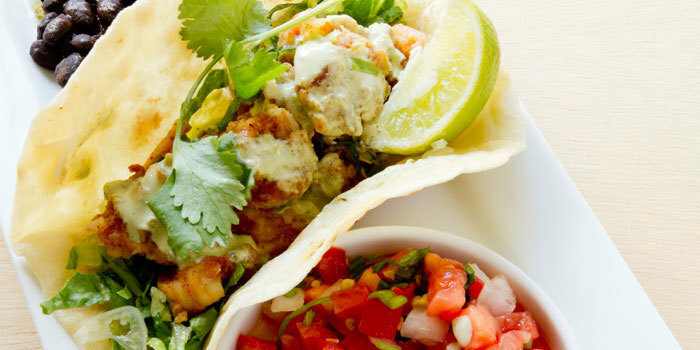 Practitioners and consumers of Tex-Mex sneer at Mexi-Cal, calling it "yuppie food." These epithets aren't altogether objectionable: as someone who also enjoys Tex-Mex (it has a laudable blue collar, do-it-yourself approach to food: if it doesn't taste right, reach for the hot sauce), I'll admit you've got to have more in your wallet (or in your credit rating) if you're going to really dig in to Mexi-Cal. Mexi-Cal foodies, when they aren't fastidiously vegetarian, don't mind experimenting with fish - any fish: shelled, smoked, pickled, pan-fried, whatever. The vegetarian variations will (obviously) eschew all contact with lard, so you won't get the genuine "re-fried beans" you might have developed an unhealthy fondness for. But Mexi-Cal connoisseurs know the difference between cilantro and Mexican oregano, and they use their knowledge to good effect. Consequently Mexi-Cal food is robust; it doesn't need extra heat, but won't suffer from it, either. There are several ways to get the Mexi-Cal experience: on the street, or at home. One affordable SJ MC restaurant I've raved about before is Aqui. Those who want to give the home-cooking effort a try could do worse than start with Southwest Turkey Chili. Or you can check out the ultimate Mexi-Cal reference: California Rancho Cooking, by Jacqueline Higuera McMahan. This entry is a little embarrassing, but I believe it constitutes a significant aspect of the Californian mentality that appeals to me, so I will confess it: I'm sorry to say goodbye to San Jose because it means saying goodbye to D & J Hobby. Some background: when I was 12, I joined a model-building club that held a town contest in the early spring. I hiked over to the local hobby store (a vendor that could have been set up in a typical master-bedroom closet, with space to spare) and sought out the coolest model available. This being 1977 - too early for George Lucas to properly capitalize on Star Wars, and consequently too late to choose anything particularly "cool" - I settled for an F-15 Eagle (an airplane the US Navy developed then scrapped within a year), grabbed a tube of Testor's glue and a handful of paints, then paid seven dollars for the mess and hurried home. Things went badly right from the start. My paintbrush was a blocky construction with brittle bristles that raked the paint over the plastic, producing a wide array of uneven loops and swirls. It didn’t occur to me until I’d finished the majority of painting that the cans of spray-paint on display next to the little bottles were there for the body-work, while this brush could probably have done an adequate job of the details. By then it was too late: an immaculate application of spray-paint would have done little to hide the damage I’d inflicted on my model. Still, the money was spent, so I proceeded with the task of building. When it was time to glue the cockpit to the fuselage, I accidentally spilled a large drop of cement on the plane’s clear-plastic canopy – D’oh! I gingerly wiped it off, but this was now my model’s second fatal wound. In a panic, I called my father’s office to tell him what happened. He generously called a parishioner who had won a few of these contests, and returned to me with the following advice: “Try scraping off the glue with a razor, then polishing the scratches with some Brasso.” Hope was once again restored, but although I whistled while I worked, the effort produced further disaster. I pondered my predicament, and came up with an ingenious solution: paint the canopy black! The end result was, I thought, rather dangerous-looking. Other problems arose that only model makers can relate to. The plane’s landing gear was spindly, and if you attempted to put the airplane’s weight on the wheels before the glue had properly dried, the result was surreal. I discarded the newly-warped landing gear, and glued shut every workable door and hinge. The final result bore my unmistakable fingerprint – several of them, in fact. I very much doubted I’d win any sort of prize, but I entered the contest anyway, curious to hear what the judge would say. The hoots of laughter haunt me still. I gave up model-making after that, but when I turned 30, I bought my first kit in years – a P-38 Lightning. I took my time with it, and must admit, felt immense satisfaction with the final result. I haven’t hung it with fishing line from my bedroom ceiling (in fact, it’s not on display anywhere), but I do make it a habit to build a model a year. 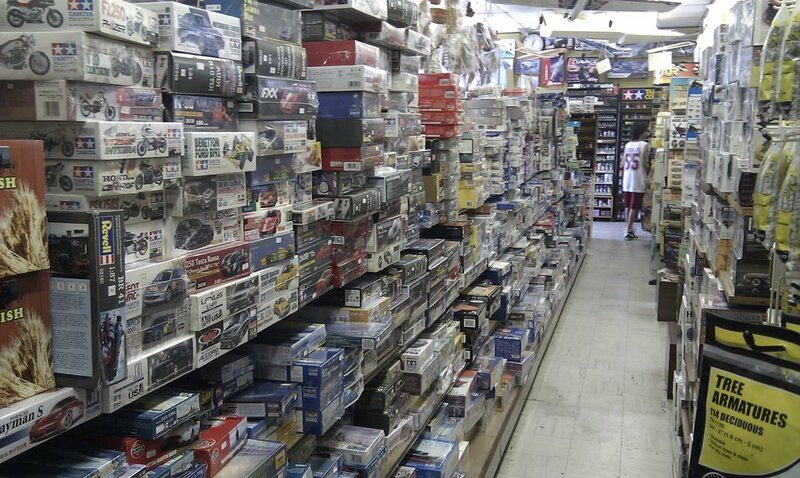 And D & J Hobby, an enormous, cluttered mess of a store, has for the last ten years provided me with the best of them. Americans sure do love their hot sauce. It’s a rare restaurant that doesn’t have a rack of little red bottles just behind the cashier. 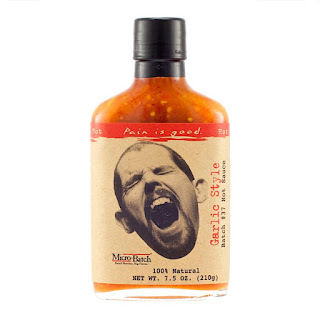 A tourist could spend hundreds of dollars on the stuff and be hard-pressed to discern much difference between brands: most hot sauces are an unimaginative combo of Habanero peppers and vinegar, with salt and occasionally a little (choke) powdered garlic thrown in. There are, however, some geographic characteristics to consider and enjoy. It’s been my experience (a host of exceptions allowed for, of course) that if you begin your southward journey in the eastern states, the hot sauces pretty much begin where you expect (think: Tobasco), but increase their heat as you descend further into the south. By the time you hit New Orleans or Dallas, there’s little point in crossing the border to Mexico, because American Can-Do Attitude has been applied to the science of hot sauces with great effect, producing a plethora of sauces that are entirely unfit for human consumption. I see little point in indulging such an extreme, but will admit that the endorphin rush I get from adding a little Dave’s Insanity to my chili collaborates very nicely with the buzz produced by the beer I guzzle for relief. Beyond Dave’s exists a wasteland of criminally hot sauces: if you seek such novelty, Da Bomb somehow manages to impart a modicum of flavor with its torment, and comes in a charming medicinal bottle that will attract attention in any fridge. No doubt hotter sauces exist, but hotter than that I will not go. There are probably Californian outlets that cater to this sort of craziness as well; I just haven’t encountered any. The Californian attitude toward spice of any stripe is to explore its breadth, not its deepest impact. Thus, while dealers of “Tex-Mex” might sneer without irony at the affectations of fusion cuisine, “Mexi-Cal” practitioners proceed with unshakeable hippie bliss to experiment without end. This is the environment in which I discovered Pain Is Good Batch #37. Pain isn’t nearly as excruciating as it makes itself out to be, but it does have an unmistakable heat. More than that, however, it has incredible flavor. Batch #37 is a garlic sauce, but the first ingredient is carrots. The list continues: minced garlic … mustard seed … olive oil, lime juice, lemon juice, etc. The combination is a thrill – I dump the stuff on dishes like Spaghettini Aglio E Olio, add a little parmesan, and dig in. “Very nice,” you say, “but is it Californian?” Well ... no. Pain is manufactured in Kansas City, of all places. But I was introduced to it in California, and so it remains in my experience a delight I will always associate with the State. Canadians can get their supply here. Return From California: The Conclusion Of An Arm's-Length Love Affair? The State of California took hold of a particularly feverish corner of my brain at a very young age. This was due chiefly to the television shows of my youth and their aesthetic, which held a Pleasantville sort of appeal that retains its power over me even now. 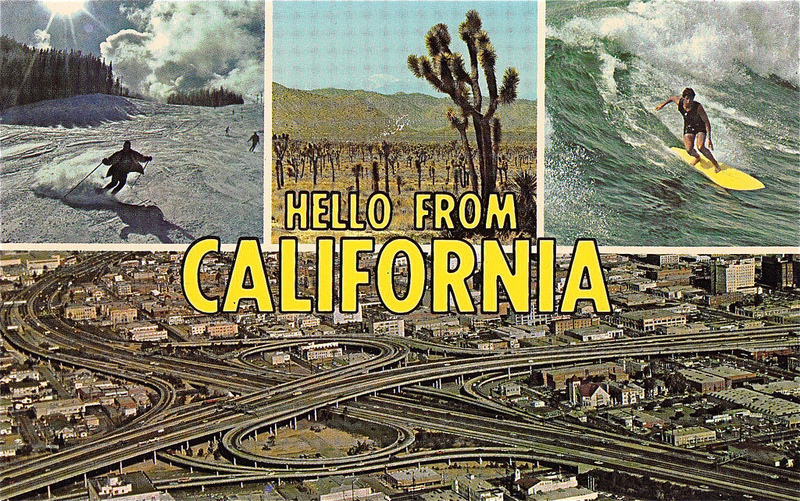 I first visited California when I was 16, and returned to the state once in my early 20s. Ten years later my father announced he'd accepted a pastorate in San Jose, and I couldn't help feeling a little ripped-off. This was so typical. My parents waited until I left home before they bought a color TV. A VCR was purchased when I moved to another city. 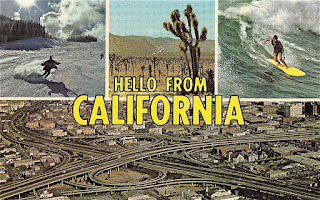 Now I was married, and conspiring with my wife to begin a family of our own, and my parents were moving to California - land of my most delirious childhood dreams. Living in California is no longer my deepest desire. I wouldn't object to a year or two of Californian exile, but the place is perverse enough to sour the dreams of all but its wealthiest citizens. Unless you exist in the vaunted .01%, it doesn't matter what rank you occupy on the food chain: you have to work like the devil to live there. Still, every visit we've made in the last ten years has amounted to something of a perverse thrill - consider it an arm's-length love affair, which allows for all the high and none of the jones. The fantasies California inspired in me as a child were allowed to flourish, unimpeded by the banal impositions of everyday life. I could visit Santa Cruz and, channeling Walter Mitty, dream of being a blissed-out surfer. I could walk the vertical streets of San Francisco and dream of being Beat. I could even talk with friends who had moved to Silicon Valley and dream of being a free-market, code-writing geek. Last summer my father turned 65 and used the occasion to announce his intended retirement. Preachers can preach until their last breath (or beyond - I'm starting to wonder about Billy Graham), but most pastors gratefully acknowledge the 65-mark because even the healthiest congregation pulls a large draught from the emotional reservoir. His congregation is an exceedingly warm and generous bunch, but retirement in CA is out of the question, so my parents are returning to the Canadian prairies. I now have to face the fact that I will no longer see Mistress California on quite so regular a basis. I am already in mourning over the loss of many particularly Californian pleasures. In an effort to come to grips with my grief, I will hereby ennumerate ten of my faves - many of which can be sampled and largely enjoyed in the comfort of the non-Californian home. If you'd like to see all 10 in one page, simply click here and scroll down. If you're a sucker for the suspense of Top Ten lists, start at number 10 - here.